As a boy, Ramzi Aburedwan found himself caught up in the first Palestinian uprising, a well-known photo at the time showing him holding stones to throw at Israeli soldiers. He has since become a respected musician and composer, who gives back to children from Palestinian refugee camps, like himself. Today, he provides musical training to around 2,000 of them through his project called Al-Kamandjati, or The Violinist, in Arabic. Aburedwan, now 38 and who grew up in Al-Amari camp in the occupied West Bank's Ramallah area, says he hopes to create a "strong future generation capable of expressing itself" through such projects. He launched Al-Kamandjati in 2002, wanting to offer youngsters from the camps and other poor children access to expensive musical instruments and music theory classes. The violinist, who studied music in Angers in western France, began by collecting instruments donated by various institutions across Europe. On his return to Ramallah, he extended the project in 2008 to Beirut's Shatila refugee camp as well as the Bourj el-Barajneh camp in Lebanon. Aburedwan's project now counts eight music schools and more than 2,000 students aged between five and 18. In March, Palestinian officials named him cultural figure of the year. The composer, with a neatly trimmed beard, thinks back with pride to the old photo of himself as a child in a red jacket with stones in hand, taken in 1988. At the time, "we had to protect our camp from the soldiers", he said of Al-Amari, one of the refugee camps set up to house Palestinians displaced by the creation of the state of Israel in 1948. With another mass exodus caused by the Six-Day War of 1967, almost eight million Palestinians are considered refugees, with most of them living in camps across the Middle East. The future is bleak for many who grow up in poverty, and that could have been the case for Aburedwan had fortune not smiled upon him. As a teenager, he worked odd jobs to earn money where he could, hawking newspapers and doing gardening work for families in Ramallah. One of the women who hired him "heard something about a scholarship to learn music in France", he said. "She proposed my name and I landed in France, where I learned music before starting Al-Kamandjati," said Aburedwan. 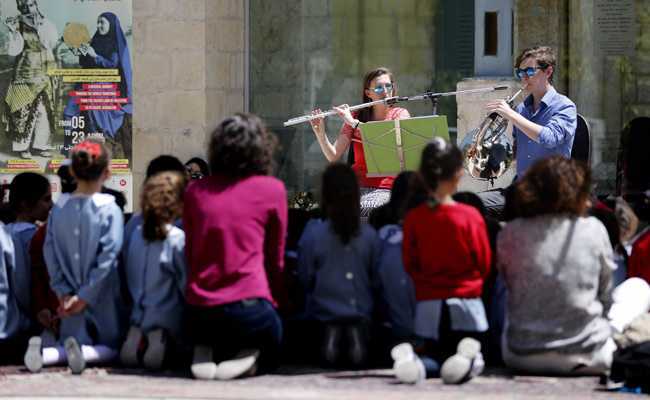 Recently, a group of music students from the Qalandia refugee camp, north of Jerusalem, were training along with musicians teaching violin and cello as part of Aburedwan's programme. "I started to learn music in the Qalandia camp with the Kamandjati group when I was seven," said Tayib al-Hamouz, 16. Teacher Montasser Jibreen, 25, started to learn music in 2005 with Kamandjati. "I played clarinet and after I finished school I got a grant for music at Angers University and was the conductor in the orchestra," he said. Beyond teaching music, Aburedwan decided to spend this year inviting musicians from abroad to perform for Palestinians. Performances have been planned for camps, auditoriums, the ruins of ancient palaces in the West Bank, the blockaded Gaza Strip and Jerusalem. Dozens of performances were held over 18 days at the ruins of Hisham's Palace in the West Bank city of Jericho, including Rajasthan gypsy dancers with their colourful dresses. At the Haram al-Sharif in Jerusalem, the Jerusalem holy site that includes the Al-Aqsa mosque compound and the Dome of the Rock, whirling dervish dancers performed. However, Sufi music and dance did not please everyone: Aburedwan and other artists were escorted away from the site by offended worshippers. But it takes more than that to discourage the kid from the refugee camp. A few hours later, dozens of people applauded the Turkish dancers at another location on the outskirts of Jerusalem's Old City.